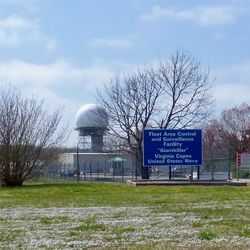 Oceana NAS Radar Site (1980-Active) - A Joint Use Radar Site first established in 1980 on Oceana NAS, Virginia Beach City, Virginia. Initially assigned a SAGE ID of Z-321, a JSS ID of J-01 and a FAA ID of QVR. Active joint use (USAF/USN/FAA) Radar Site. This site became a USNUSAF//FAA joint-use site in 1980, furnishing radar track data to the FAA, USAF, and USN. Initial radar equipment included an FPS-93A search radar and an FPS-116 Height finder. The FPS- 116 was removed circa 1988. The FPS-93A was replaced by the ARSR-4 in the late 1990s. The ARSR-4 radar was capable of providing both search and height-finder information and is still in place. Oceana NAS Radar Site Roadside Sign. Active facility on Oceana NAS, Virginia Beach City, Virginia. Location: On Oceana NAS in Virginia Beach City, Virginia. Winkler, David F., Searching the Skies: the Legacy of the United States Cold War Defense Radar Program, USAF Hq Air Combat Command, 1997, 192 pages, Pdf, page 57, 162. This page was last modified 21:40, 7 January 2019 by John Stanton. Based on work by Bill Thayer.